If you believe everything you read in the comment sections, compressor surge – also called flutter – is basically the sound of impending doom, but that’s not necessarily true. Let’s get something out of the way right at the start. Most factory-standard turbocharged engines shouldn’t suffer from the dreaded compressor surge or turbo flutter. It’s not something that any self-respecting car maker would allow in one of its engines because it’s technically inefficient. But, then again, turning a few dozen litres of V-Power into noise and exhaust gases makes no sense to most people either, but us car nuts do rather enjoy that sort of thing. Turbo flutter tends to rear its head in modified engines. Whack a big ol’ snail onto an engine setup not necessarily designed to swallow so much boost at the drop of a hat, and you can run into problems. If you’re boosting hard and then lift off the throttle there’s a moment between the lift and the turbo realising what’s gone on. The throttle plate has snapped shut but the turbocharger up the road is still trying to force air into the chamber of secrets. The air has nowhere convenient to go. The easiest route out involves going back through the turbine, which will still be spinning at least 80,000rpm, maybe as much as 200,000rpm. The air can’t just spin the turbine backwards; can you imagine the kind of force that would involve? Instead, it only slows the now free-spinning blades and gets literally chopped into chunks back through your induction piping. This is what causes the famous fluttering whistle from the turbo. Still, it doesn’t sound like the healthiest thing, does it? Well, it depends on when you hear it. Normally, as about a billion YouTube videos will testify, it happens when the driver lifts off the happy pedal under heavy engine load. That’s not really a problem. Sure, it’s slowing the turbine and means boost will be slower to rebuild if you mash the accelerator again, but mechanically speaking it’s not likely to harm the turbo. 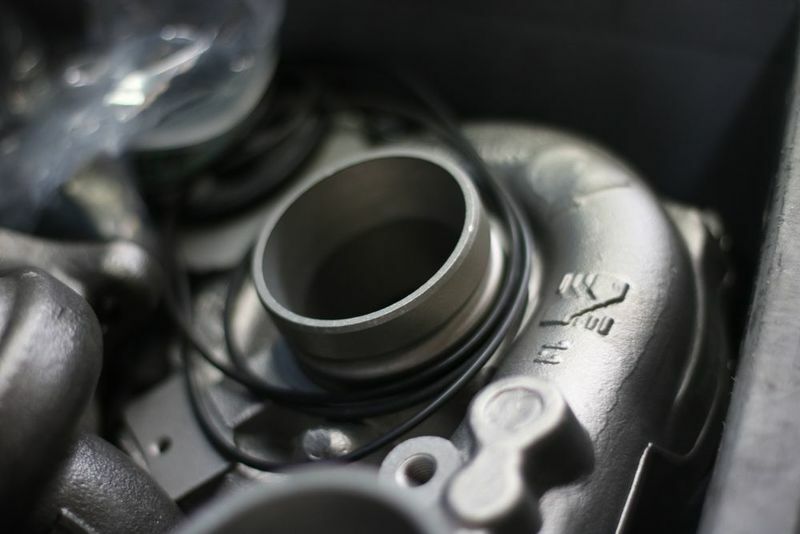 A blow-off valve offers another way to vent that excess pressure between the turbo and throttle plate, but that sound is just so 2009. On the other hand, if you hear turbo flutter when you’re on the power – known as open-throttle compressor surge, then brace for big bills. In that instance, the turbo is providing more boost than the engine can take. Trying to force more air into the block than can physically be passed through gives you the same problem as before, but this time the turbo is under high load as the back-pressure spikes. That puts epic strain on the turbo bearings and will ultimately cause them to fail, but it is all still debatable. Open-throttle compressor surge is usually hard to come by unless you have seriously upped the boost software. If you’re thinking that a blow-off valve will save your skin, think again. They don’t open while you’re hard on the throttle and won’t help you if your setup is too boost-heavy for your poor engine to cope. Armed with this info, though, you know the difference between good flutter and bad.